The fifth victim floated nearby as John Brown and his men washed blood from their swords in Pottawatomie Creek. Brown said that the killings had been committed in accordance to "God’s will," and that he wanted to "strike terror in the hearts of the proslavery people." 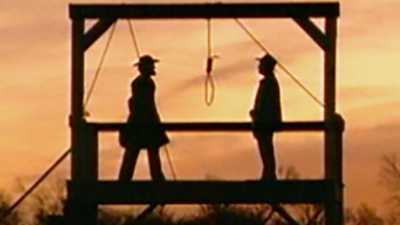 His killings would provoke fear and reprisals — pushing America one step closer to an all-out civil war. In the mid-1850’s, "Kansas Fever" swept the country. 126,000 square miles of wilderness lying west of Missouri had just been opened for settlement. Five of John Brown’s sons responded to the call, joining thousands of settlers heading west in search of a better future. But the Brown boys also went to stake a claim for liberty; they went to ensure that the new territories would be kept free of slavery. The Missouri Compromise, which restricted the expansion of slavery, was swept aside by the Kansas-Nebraska Act of 1854. With a nod to Southern power, the federal government decided to place the volatile issue of slavery into the hands of those settling the new territories. The people would decide, by popular vote, whether to be "free" or "slave." Free soil and proslavery forces poured into Kansas, and the territory erupted in violence. On March 30th, 1855, a horde of 5000 heavily armed Missourians -- known as "Border Ruffians" -- rode into the territory. They seized the polling places and voted in their own legislature. Severe penalties were leveled against anyone who spoke or wrote against slaveholding; those who assisted fugitives would be put to death or sentenced to ten years hard labor. 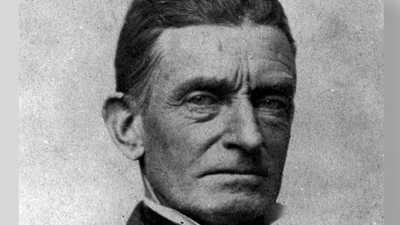 John Brown was initially reluctant to join his sons in Kansas. He was 55, an old man by the actuarial tables of his day. He seemed worn down, broken by a lifetime of failures and disappointments. But a letter from Kansas changed his mind. The free-soilers needed arms "more than bread," his son John Jr. wrote. "Now we want you to get for us these arms." The next day John Brown packed a wagon and headed west, gathering weapons along the way. "I’m going to Kansas," he declared, "to make it a Free state." When Brown arrived at his son’s homestead, he was dismayed at what he found; his boys were starving, shivering with fever. In three weeks Brown built a sturdy log cabin, then another. He quickly brought order to their homestead - named "Brown’s Station." Of the five sons, John Jr. was most like his father. A blunt talking abolitionist, he was the captain of the Pottawatomie Rifles, a small group of free-state men living near the creek from which they took their name. They frequently exchanged threats of violence with their proslavery neighbors, but maintained an uneasy truce. Throughout the winter, the Brown men heard stories of Southern aggression: a battalion of 400 armed Southerners were marching into the territory, a free-state man was hacked to death, his body tossed onto his doorstep, President Pierce, a Southern sympathizer, warned that organized resistance on the part of free-state Kansans would be regarded as treasonable insurrection. For the Browns, another proslave invasion seemed imminent. When word came on May 21st that hundreds of Border Ruffians had marched on Lawrence, John Jr.'s Pottawatomie Rifles quickly assembled. Old Brown accompanied them, but did not join their ranks. He took orders from no man, certainly not one of his sons. En route to Lawrence they learned that the Ruffians had sacked the town, burned the Free-State Hotel, and not one abolitionist had dared to fire a gun. Brown was furious at this cowardly response. Within hours they received another disturbing report -- abolitionist Senator Charles Sumner had been brutally attacked on the United States Senate floor by a southern Congressman. Sumner’s speech, "The Crime Against Kansas," had provoked the attack. He was beaten within an inch of his life. "Something must be done to show these barbarians that we, too, have rights," Brown declared. He took a small group of men under his command and told them to prepare for a "secret mission." John Jr. tried to keep his father in camp, cautioning him to commit no rash acts. But the old man stuck a revolver in his belt and led his men away. They marched toward Pottawatomie Creek, to the homes of proslavery sympathizers. On the night of May 24th, 1856, Brown banged on the door of James Doyle and ordered the men to come outside. Brown’s men attacked them with broadswords. They executed three of the Doyles, splitting open heads and cutting off arms. Brown watched as if in a trance. When they were done, he put a bullet into the head of James Doyle. 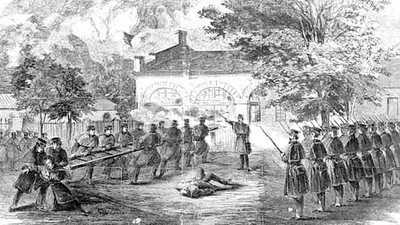 Brown’s party visited two more cabins, dragged out and killed two more men — five in all. "It was in response to extraordinary frustration and despair," comments author Russell Banks. "I really think he was like Samson trying to pull down the Temple. I don’t mean to condone it, any more than I would condone a car bomb in Belfast or Jerusalem, but there is a context, there is a progression, and we have to take a leap, an imaginative leap into his time and see the world as he saw it." Proslavery forces launched a manhunt, plundering homesteads as they searched the countryside for the Pottawatomie killers. John Brown took to the woods and evaded capture. His sons did not fair as well; John Jr. and Jason — who had not been involved at Pottawatomie -- were savagely beaten. Frederick was shot through the heart. Brown’s Station was burnt to the ground. In September of 1856, a new territorial governor, John W. Geary, arrived in Kansas and began to restore order. The last major outbreak of violence was the Marais des Cynges massacre, in which Border Ruffians killed five Free State men. In all, approximately 55 people died in "Bleeding Kansas."